Do you know which sunsceen is best for you skin? 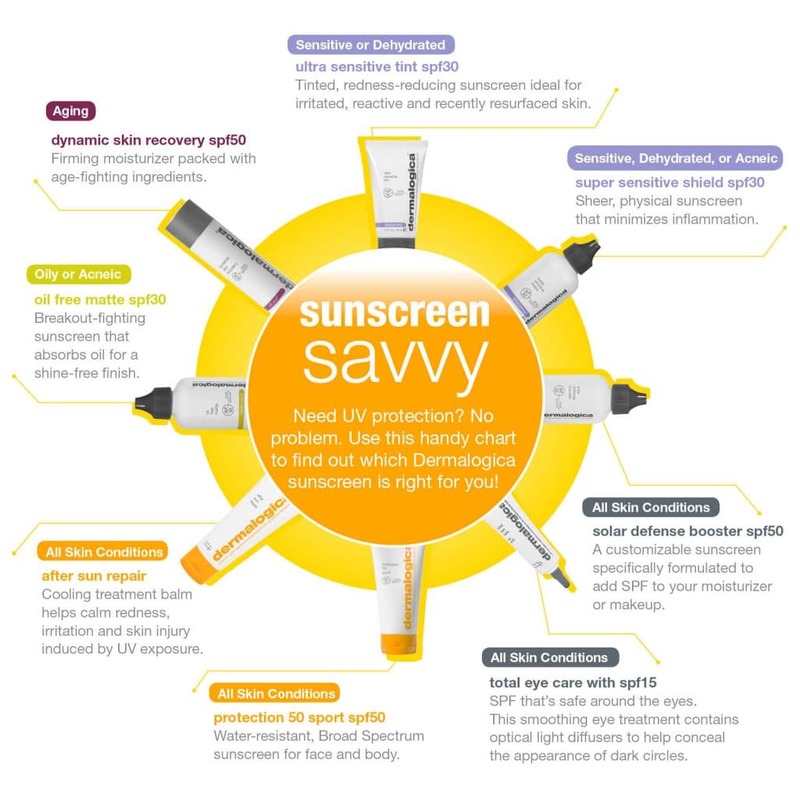 Dermalogica has produced a sunscreen for every skin type. Skin is an excellent record keeper. Every moment of exposure to daylight adds up like money in the bank – the problem is the payoff known as sun damage. As the top cause of premature signs of skin aging, sun damage shows on skin in the form of wrinkles and hyperpigmentation, and can lead to a repressed immune system and the potential for skin cancer. Statistics show that one in six individuals will develop skin cancer, and 90% of these cancers are the direct result of ultraviolet (UV) radiation from the sun. Even if exposure is limited to brief outdoor lunches or a 20-minute walk, cumulative exposure is enough to cause the signs of skin aging and increase the risk for skin cancer. The first line of daily defense against sun damage is daily use of SPF. Even on cloudy or overcast days, UV light can strike skin and cause damage, so simply wearing sunscreen on sunny days isn’t enough. The chart below helps you choose the right sunscreen for you. If your not sure speak to one of our skin specialists and they can prescribe the correct sunscreen for you. For the best results have your face mapped and skin analysed . We use our Skin Scanner to look and show you “beneath” or “through” the skin to reveal it’s true condition. Using the skin analysis and Face Mapping we can match the right products and treatments for your skin. Skin Awareness – Protect your skin!